We’re still having problems with our website – not quite all there yet! 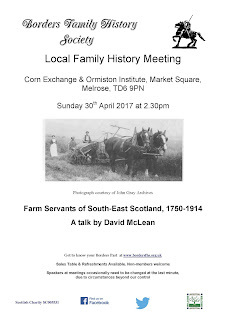 Our next meeting is on Sunday 30th is a talk by David McLean on Farm Servants of South East Scotland 1750 – 1914. So if your ancestors were Ag Labs, herds, hinds, bondagers, outworkers, ploughmen, David will explain a little more about their lives and conditions of work. Venue Corn Exchange, Melrose at 2.30pm. Teas / Coffees. The last meeting of the 2016-17 season is on Sunday 28th May. 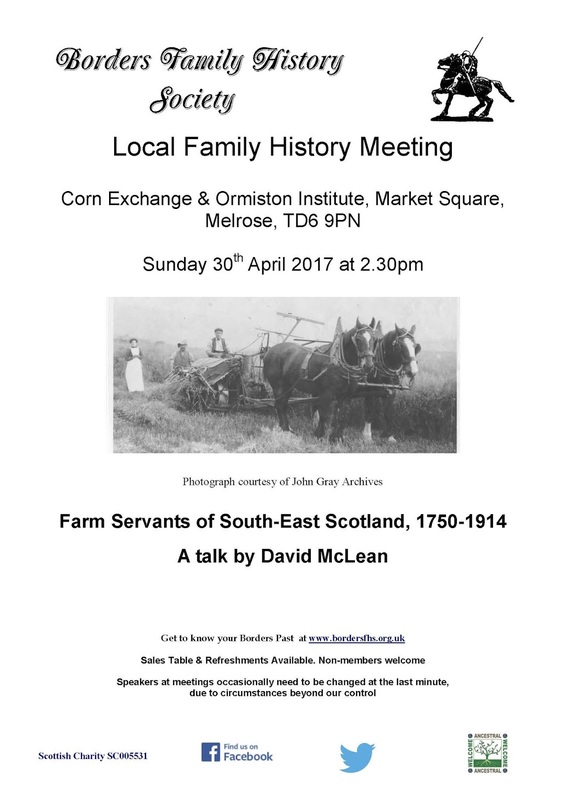 Venue Corn Exchange, Melrose at 2.30pm when the talk will be preceded by the Society AGM. Please come along to find out what we have been doing and also about our plans. Will Collin will present an illustrated talk on "William Collin and the ‘Christina Craig’ - An Eyemouth Maritime Family Story from the Great War". 2018 marks the 100th anniversary of the loss of the Christina Craig, one of many Eyemouth fishing boats and crews which were signed up by the Admiralty to serve in the WWI Auxiliary patrol. Many photographs remain in the Collin family and are included in the talk. Our original speaker Margaret Fox is unable to come along in May 2017 but has kindly agreed to reschedule her talk in 2018. You can also find us and contact us on facebook or on twitter or send a letter to our address at Overhaugh St, Galashiels, TD1 1DP.